* WhiteHorse air purifiers are designed for large spaces such as conference rooms, auditoriums, gyms, restaurants, etc. The WhiteHorse has a 7 stage filtration system, comes with 2 filter elements, has an inbuilt monitor and has wheels for easy mobility. * Kinnaur Air Purifier is ideal for smaller spaces such as kids rooms, puja rooms, etc. * Raahe Car Purifier is designed for cars. Given the long hours many spend on the road, it helps to keep the air inside Ozone free. Neutralizes harmful VOCs and other toxins. The air purifier comes with visual indicator for air quality. There is a child lock function to prevent any unknowing interruption. Auto restart after power interruption. Filter replacement alert. Timer function for optimum usage. Six layers of filtration ensure high efficiency and dust holding capacity. Dust particles removal efficiency rate is 99.9% at 0.5 micrometer. Filter frames are made with a unique ‘one of a kind’ design which make them strong, durable and leak proof. Elofic filter element consists of a carbon embedded design as opposed to the commonly used ‘honeycomb design’ (which leads to micro dust particles escaping) ensuring that even the smallest dust particles don’t escape. 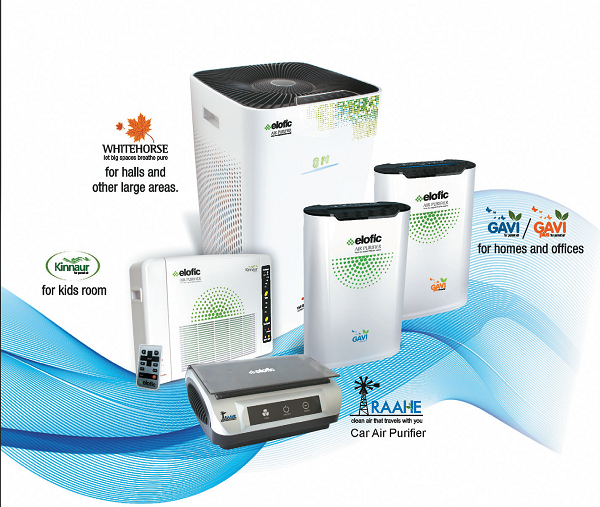 Elofic Air Purifiers are attractively priced & cost effective.